The City of Carlsbad has joined a long list of California cities that have decided to switch to electing City Council members by district instead of “at large” or citywide. The change means that the city now has four City Council districts, with voters in each district electing a Council member who lives in that district. The mayor will continue to be elected “at large,” meaning voters from throughout the city will vote for that position. In response to a lawsuit threat, the Carlsbad City Council voted May 9 to voluntarily move to district elections, taking advantage of a legal protection that enables cities to have a say in district boundaries and avoid costly litigation. Dozens of local government agencies in California have faced similar challenges in recent years, including our neighboring cities of Encinitas, Oceanside, Vista and San Marcos. To date, no city has prevailed in challenging lawsuits brought under the California Voting Rights Act, and instead, many have paid legal fees in the millions and still ultimately been forced to move to district elections. City Council member elections are staggered every two years. The seats held by Council Members Mark Packard and Michael Schumacher are up for election in 2018. District elections will be phased in, with district one, in the northwest part of the city, and district three, which runs west to east in the middle part of the city scheduled to hold elections in 2018. The other two districts will hold their first district elections in 2020. City Council members serve four year terms. district one. Her term ends in 2020. She may run for the district one seat and, if successful, would begin serving that 2018 to 2022 term representing the district, and the City Council would need to fill the remaining two years of her “at large” term. If she chooses not to run in 2018, or if she runs and is not elected to represent district one, she would still serve out her current term as an “at large” City Council member until 2020. To fill an unscheduled City Council vacancy, the City Council may call a special election or appoint someone to fill the remainder of the term. District maps are required to be reviewed every 10 years based on the latest Census. This means that district boundaries will be reviewed in 2021 using the 2020 Census data. Based on that review, the district lines could change for the 2022 election. In all, the city’s demographers prepared four options, and members of the public created 10 maps that would comply with the criteria for districts under federal and state law. The map ultimately chosen by the City Council was a collaboration between two residents using the map making tools provided by professional demographers hired by the city. 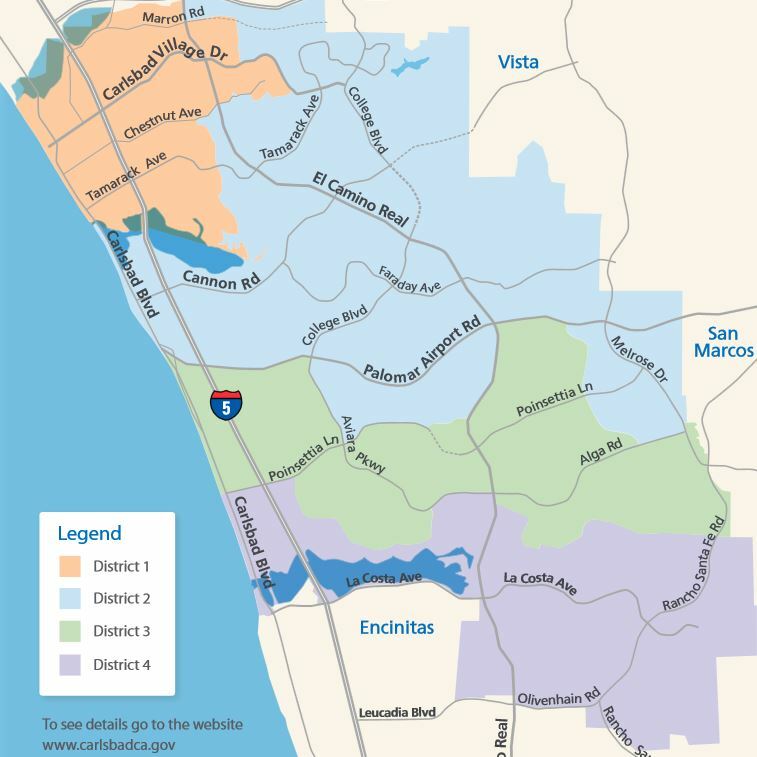 More information about the change to electing City Council members by districts, including detailed maps that let you zoom in to see individual properties, is available on the city’s website, www.carlsbadca.gov/districts.